Which Neckline Should I Choose? There are many types of Neckline available. Here, we explore some of the more popular ones: Bateau, Cowl, Halter, High-Neck, Off The Shoulder, One Shoulder, Queen Anne, Scoop, Spaghetti-Straps, Square, Strapless, Sweetheart and V-Neck. From the French word meaning "boat", the Bateau Neckline is also commonly referred to as a "Boat Neckline". It has a fairly wide neckline, which follows the natural curve of your collarbone. This neckline sits quite high up on the chest, thus it is considered a more modest neckline shape. A similar style, which is slightly more curved and not quite as wide, is known as a Sabrina Neckline. Some dresses with a Bateau Neckline will have the same neckline style on the back of the dress, although many dresses will juxtapose such a high neckline with a much deeper backline or even a backless style. Try It: This neckline is ideal for smaller-breasted ladies, as it can give the illusion that your chest is larger than it actually is. Similarly, if you are pear-shaped, this neckline will help balance out your wider hips, and make your body appear more hour-glass shaped. Avoid It: As this style sweeps across the collarbone, it can emphasize broad shoulders or highlight a shorter neck. Larger-breasted ladies should avoid this style if they don’t want to appear larger than they actually are. Often said to have been inspired by the draping of Grecian fashions, the Cowl Neckline was made popular by Madeleine Vionnet in the 1920s and 30s. It features folds of excess fabric, draped around the neckline, as if the wearer has a shawl or scarf draped across her bust. The amount of fabric used, and the width and neatness of the folds, will vary from gown to gown. Depending on the style of the dress, the cowl neck may sit higher up, close to the collarbone, or may scoop down much lower, reaching, or even passing, the bust-line. Cowl Necklines can add a touch of drama or interest to a neckline that may otherwise be plain. Try It: The extra fabric will add volume to the bust-line, so it is a good option for smaller busted ladies. It can also help to balance out your hips, and draw attention to the bust, if you are pear-shaped. Avoid It: This style is best avoided by ladies with a larger bust, or a fuller figure, due to the extra inches added by the excess fabric. Petite ladies should choose a smaller cowl neckline, to avoid being swamped by too many layers. Another style that was made popular by Madeleine Vionnet in the 1930s, the Halter Neckline features two straps of material, which extend from either side of the neckline, and either tie, or are fastened, behind the neck. A Halter style is often coupled with a Scoop Neckline, or a V-Neckline, and it is common for dresses with a Halter Neckline to be backless, or to have a low back. This neckline can offer less support to the wearer than some other necklines, so, if you require some extra support, look for a Halter Necklined dress with a more structured bodice (or invest in a good strapless bra!). Try It: This style will draw attention to the chest, and is therefore suitable for ladies with a small to average bust, or for ladies that simply want to accentuate this area! It is also ideal if you wish to show off your toned, well defined arms. Avoid It: Halter Necklines emphasize the shoulders, so if you are particularly broad or narrow shouldered, this is a style to avoid. This style will also emphasize the chest, so if you have a larger bust it will make you look larger than you actually are. It can also highlight wider upper-arms. Also referred to as a “Jewel Neckline” and a “Crew Neckline”, this classic, timeless style sits high on the chest, just below the base of the throat, and follows the natural curve of the neck. It is sometimes called a T-Shirt Neckline, due to its resemblance to the necklines commonly found on T-Shirts. High Necklines are often decorated with embellishments such as beading or jewels, or with lace, although plainer necklines can offer the perfect backdrop for an array of pretty necklaces. Try It: The often decorative nature of this neckline means that it is ideal for enhancing or emphasizing a smaller chest. A High Neck is also a great option if you are looking for a modest gown, without compromising on style. Avoid It: High Necks can make larger-chested ladies appear bustier than they actually are, especially if the neckline is particularly embellished. It can also make a short neck appear shorter. As the name suggests, an Off The Shoulder Neckline features sleeves or straps that sit below the shoulder, usually draped across the upper arm, leaving the shoulders and collarbone exposed. The line across the tops of the sleeves, which contines across the chest, will often be a straight, horizontal line, but not always – the Off The Shoulder Neckline can be paired with a Sweetheart, a V-Neck, or even a Cowl Neckline. One of the most popular variations of the Off The Shoulder Neckline is the Portrait Neckline, which features a more scooped neckline, and straps which sit slightly further up the arm. Try It: While an Off The Shoulder Neckline will look good on most body shapes, it looks especially nice on ladies with a larger chest. This neckline will also help to balance out a pear-shaped figure. Avoid It: If you have broad shoulders, or are simply not happy showing them off, then this is a style to avoid. Similarly, if you have fuller, or undefined, upper arms, be aware this style will emphasize them. Also known as an Asymmetrical Neckline, this neckline features a strap across one shoulder only. The neckline itself will vary from gown to gown, with many dresses having a neckline that is cut horizontally across the chest and supported by a single strap, while others may feature a diagonal line which starts at one shoulder, and sweeps across the chest until it reaches the opposite underarm. As a variation, some gowns with this neckline may feature a single sleeve, rather than just a strap. 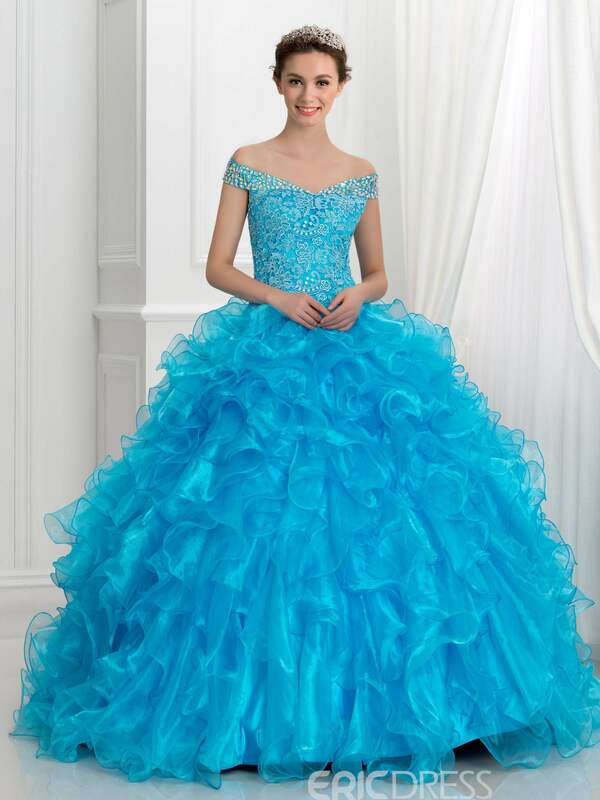 Another popular variation is where the gown has two straps, but one is much thicker, or more decorated, than the other. The asymmetry of the design can create a dramatic, different, and visually pleasing look. Try It: As there are so many variations with this neckline, it is possible to find a One Shoulder Neckline to suit almost every shape. This unusual neckline draws attention to the top half of your body, so it is ideal for pear-shaped ladies who wish to draw attention away from their hips. One Shoulder Necklines with a single sleeve offer the ideal choice for ladies that wish to cover up one arm without having to hide the other, for example due to scarring or prosthetics. Avoid It: This is one that is best avoided if you have broad shoulders. This neckline sits high across the back of the neck. At the front, the fabric extends down from each side of the neck towards the underarm in two diagonal lines. Across the chest, a V-shaped line, or a Sweetheart Neckline, extends from one underarm to the other. Overall, this exposes a diamondesque shape of flesh across the chest. It is common for Queen Anne Necklines to be embroidered with lace, and to be accompanied by sleeves. The Queen Anne Neckline gives the wearer an elegant, formal, and sophisticated look, and perhaps as a result of this, it has featured on a number of royal wedding dresses. Try It: The high neck at the back of the dress, and the thicker straps across the shoulders, make this a modest choice as well as a glamorous one. The Queen Anne opens up the neckline, elongating the neck, which is ideal for petite ladies, and anyone with a shorter neck. Avoid It: This neckline frames and draws attention to the chest area, and therefore can negatively highlight a smaller bust. The Scoop Neckline, also referred to as a “U-Neck” , features a U shaped curve, which starts at one shoulder, sweeps down towards the cleavage, and back up to the other shoulder. How deep the Scoop Neckline is can vary greatly from one dress to the next, and when choosing your scoop neckline, you should consider how modest you want the cut to be, how much cleavage you wish to show, and much support you require. The Scoop Neckline will often be the same, or at least be of a very similar depth, on the back of the dress. It is sometimes called a “Horseshoe Neckline”, because the shape it makes resembles that of a horse shoe. The wearer will often couple this simple neckline with an ornate necklace. Try It: This neckline will flatter almost all body types! It can also elongate a shorter neck. Avoid It: If you have broad shoulders, this style may emphasize this. Depending on the cut of the scoop, it can also lengthen an already long neck or face, or make a round face seem wider. This neckline features two thin straps, one over each shoulder. The diameter of the straps is so narrow, they look a little like spaghetti, hence the name. These straps can be coupled with almost any type of neckline on the bodice, although, most commonly, the bodice will feature a straight line across the chest, extending from one underarm to the other. On some gowns, these straps will be detachable, giving the wearer the option of transforming the look of their neckline based on preference or occasion. Try It: As a much slimmer alternative to a standard strap, Spaghetti-Straps look great on petite ladies and athletically build ladies, both of whom may not want the excess fabric of a thicker strap, as it could swamp them. Avoid It: Such a tiny strap can emphasize broad shoulders, or make a top-heavy lady look out of proportion – instead opt for a thicker strap. As the name suggests, the Square Neckline forms a square shape across the chest, with two thick straps descending from the shoulders to the chest in two vertical lines, and a straight, horizontal line across the chest. The corners of the Square Neckline may be rounded to create a softer look. The Square Neckline is most popular on gowns featuring an Empire Silhouette, and generally does not have much decoration. Historically, this neckline was particularly popular during the Regency Period of the early 1800’s. Try It: If you have larger breasts, this is one of the more supportive styles, but at the same time one of the less revealing. It can also help to elongate a shorter neck, or rounder face. Avoid It: Square Necklines look best with a bit of shape, so if you have smaller breasts you may wish to avoid this style. A classic style, and a popular choice for wedding dresses and ball gowns in general, the Strapless Neckline is usually cut in a straight line across the chest, with the line extending from one underarm to the other. As the name suggests, there are no straps (although some gowns may include detachable spaghetti straps), and so the support needed will come from the bodice, which is often tight fitting and rigid. This neckline may be embellished, for example with diamante, although plain Strapless Necklines are also popular, and can be enhanced with a statement necklace. Try It: This is an excellent option if you want to show off your toned arms or long neck. Whilst Strapless gowns generally look good on all body shapes, they look best on slimmer ladies with a medium-sized bust. Avoid It: The lack of straps may mean that support is an issue for larger-busted ladies. A Strapless Neckline can also emphasize broad shoulders. Whatever your shape, make sure you are confident in a strapless gown – you don’t want to spend all evening pulling it up! This feminine neckline closely resembles the top of a heart shape, with two large curves covering each breast, which meet at a lower point in the middle. This dip in the middle of the chest means that the Sweetheart Neckline looks slightly similar to, and is often mistakenly confused with, the V-Neck. 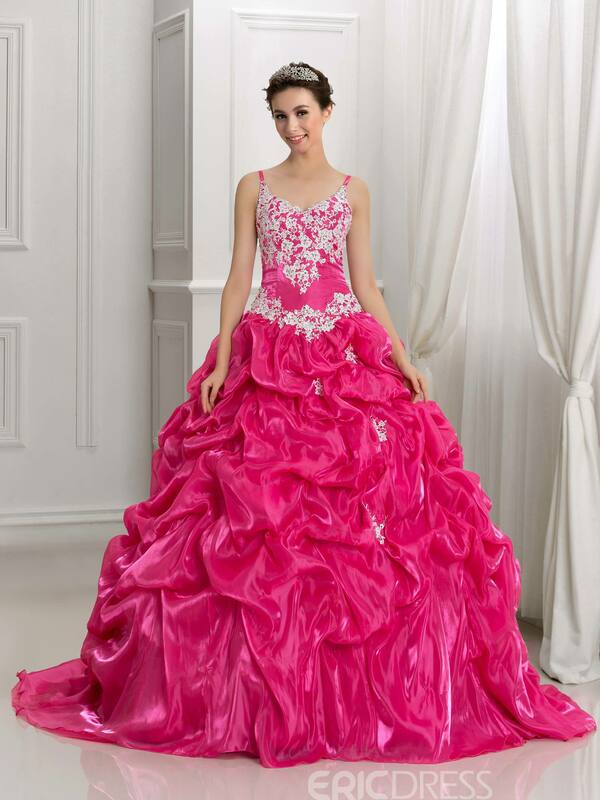 It is a popular choice for both wedding dresses and evening dresses. Sweetheart Necklines are most commonly strapless, but can also feature spaghetti straps, thicker straps, or even sleeves. An overlay of sheer fabric can be added across and above the neckline, covering the chest up to the neck, making the Sweetheart Neckline more modest. The interesting shape of this neckline draws attention to the bust area, and the neckline is sometimes embellished with jewels or diamante. Try It: This neckline can accentuate and flatter a larger bust. It can also draw attention upwards, and away from the hips, if you are pear-shaped. Avoid It: One to avoid if you are smaller-chested. 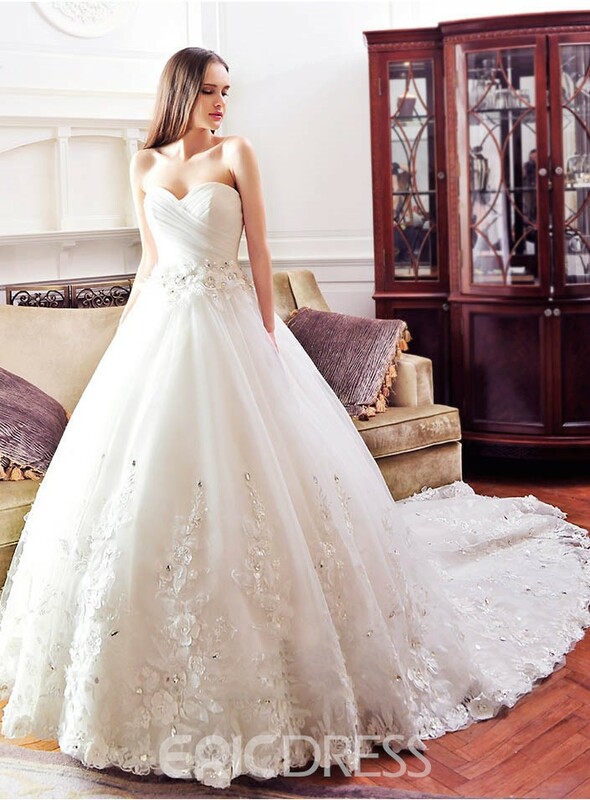 If you are looking for a unique wedding dress, be aware that this is one of the most popular choices. This popular, classic neckline is so called due to the “V” shape it creates. Fabric draped across each shoulder flows across the chest at a diagonal angle, until both pieces of fabric meet in the middle of the bust. The depth of the V-Neck will vary from gown to gown, and although the more common V-Necklines stop midway down the busy, V-Necks can extend much further. Depending on the design of the gown, it may be possible for a seamstress to raise the depth of the V-Neck for a more modest look, or alternatively to lower the depth. The deeper the drop, the more daring and dramatic the look (and the more confidence required to pull off the look!). Try It: The V-Neck will flatter almost every figure! The drop of this neckline can make you look longer and leaner, so it’s one to try if you are petite or plus-sized. Avoid It: If you are large-busted, or require a more modest gown, ensure the cut isn’t too deep – you don’t want to reveal more than you were intending to!